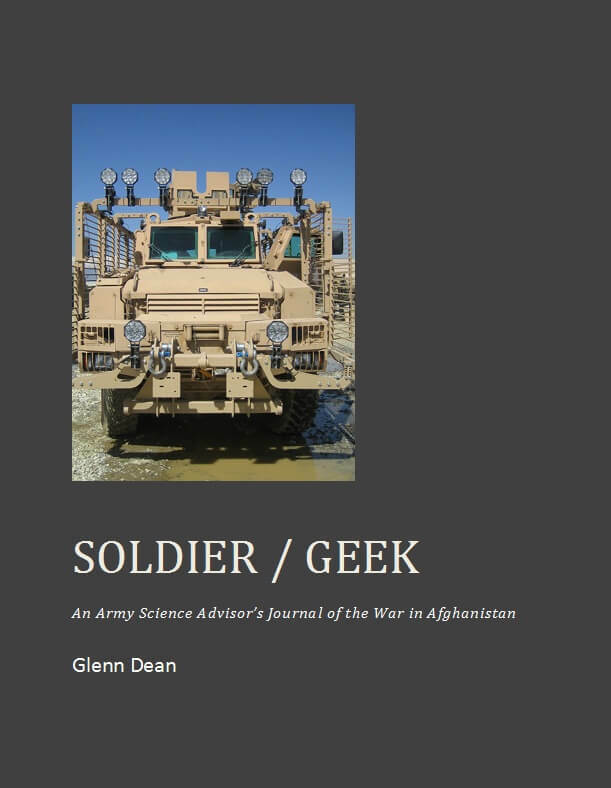 I recently finished reading Soldier / Geek by Glenn Dean. It’s an edited copy of the journal that Glenn kept during a six month deployment as a science adviser in Afghanistan. I found I had some questions after reading it, so asked Glenn if he’d mind answering them on my blog, and he agreed. 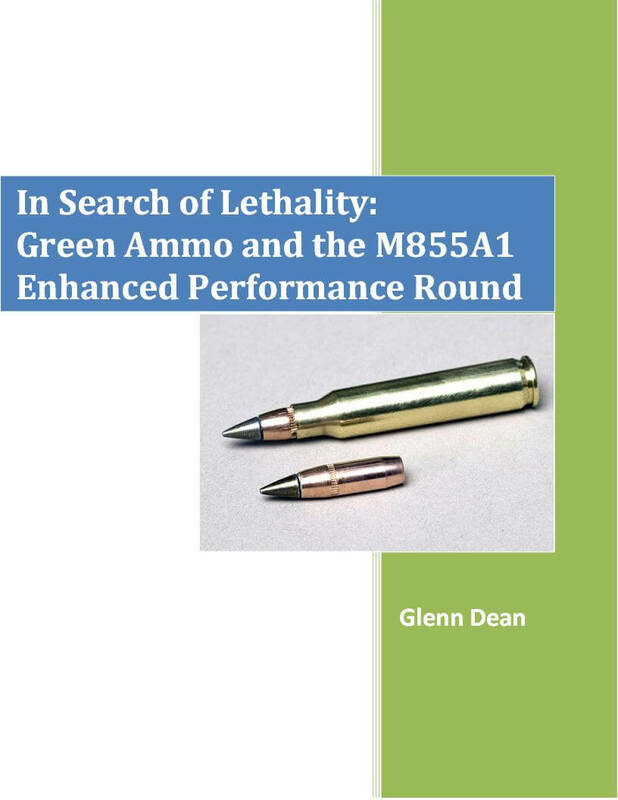 Glenn has also written In Search of Lethality (a short book about development of the M855A1 Enhanced Performance Round) and Weapons of the Zombie Apocalypse. Russell Phillips: Can you give us a brief summary of your career in the army thus far? Glenn Dean: I was commissioned as an Armor officer in 1993, and after my initial training was assigned to the 3rd Brigade, 24th Infantry Division (later 3d Infantry Division) at Fort Benning, Georgia, where I held normal assignments for a lieutenant — M1A1 tank platoon leader, Bradley scout platoon leader, and company executive officer. I departed Fort Benning for advanced training and then as a captain took command of a Recruiting Company for two years, followed by an assignment to Fort Hood, Texas in 1st Cavalry Division. There I served as a Brigade staff officer, an M1A2 tank company commander, and a headquarters company commander. Leaving Fort Hood, I transitioned to my secondary specialty as an Acquisition Corps officer, attended graduate school at Georgia Tech, and went on as a major to be the Small Arms Division chief at the Infantry Center, responsible for developing requirements for the Army’s small arms weapons and ammunition. Subsequently, I moved to Picatinny Arsenal, New Jersey where I worked in program management in medium caliber cannon ammunition, and did quick reaction technology work in the Armaments Research, Development, and Engineering Center. While assigned to ARDEC I volunteered for my science officer assignment in Afghanistan. Since my return from Afghanistan I’ve been working in another program management assignment in combat vehicle development. RP: Soldier/Geek is based on a journal that you wrote during a 2009 assignment in Afghanistan. Given that you published only three years later, with the conflict still current, did you have to get permission to publish your journal? If so, how difficult or easy was it to get permission? GD: The Army publishes guidelines for bloggers and social media which I follow, which emphasize among other things protection of operationally sensitive information. I made a point even while journaling in theater not to keep too many specifics which could be easily exploited. Since 2009 tactics have shifted quite a bit with the focus on partnering with the Afghans so in three years’ time there have actually been significant changes in operations. RP: What prompted you to publish your journal? GD: My family encouraged me. They’d received a number of my journal entries as letters home, and thought other people would be interested in the perspective, since you don’t hear much about how technology gets to the war zone. When a computer game blogger I follow — Shamus Young of TwentySided — started posting about self-publishing his first novel about the same time my parents both picked up e-Readers, it got me interested in exploring the idea of self-publishing in eBook format, and it took off from there. RP: How much editing did you have to do to your journal to make it fit for publication? GD: More than I’d like but never as much as I need! I actually intentionally resisted for the most part rewriting the content of the journal entries — I wanted them to be as fresh as I could from the day I wrote them down so readers could take the same journey I did. Aside from the changing of names the entries are almost unchanged. The surrounding explanation took quite a bit more work, and I still find some errors from time to time which show that the editing is never quite done. RP: Reading Soldier/Geek, it’s easy to get the impression that the main emphasis in 2009 was on Iraq, and that Afghanistan was something of a side-show. Do you think that’s accurate? GD: To tell the truth I didn’t have the strategic perspective to judge objectively. From my little part of the war, most of us certainly felt that way. We did see a significant shift in focus just during my tour, since I communicated regularly with my counterpart in Iraq. At the beginning of my tour it seemed like most of the equipment headed our way was cast-offs from Iraq, while by the time I departed it was clear the Afghan theater was growing significantly and we were given “shopping lists” of equipment we wanted transferred in — mostly at the expense of units headed to Iraq. “Afghanistan is not Iraq” was a mantra we repeated for quite a while, but by the time the big surge of troops began in 2010 it became clear that lesson had been learned. RP: In Soldier/Geek, you say that “Frankly, I’m not sure a strategy focused on a strong central government is a good one for Afghanistan“. It sometimes seems to me that, when trying to establish democracy in other countries, America always tries to impose its own style of democracy. I don’t think that’s always a good idea. Would you agree? GD: Well, take with a grain of salt political or historical opinions expressed by engineering majors like me, but yes. I personally believe that successful democracies like the United States have found their own way there, and expecting that we can make another culture think exactly like us without taking the same journey is unrealistic. At best, I think we can set an example, emphasize fairness and respect for human rights, and provide a helping hand, but should be willing to accept that other countries and cultures may have a different view of what specific form of government works best for them. RP: Towards the end of your deployment, you wrote in your journal, “we continue to read more news of Americans becoming disenchanted with this war“. Do you think this dissatisfaction at home is a problem of counter-insurgency wars, which tend to be long and with ill-defined victory conditions, or a problem of modern society being accustomed to quick fixes? GD: I suspect I am not representative of all Americans on this, but I think both contribute, and are compounded today. COIN is hard, demanding, time-consuming work, and long-term gains may require real shifts in how people think. That requires a commitment that is hard to sustain in a culture of 24-hour information cycles, 140-character news updates, and quarterly profit-and-loss statements. I’ve met people who are often surprised at the places the US Army still operates, like the Balkans, just because that information isn’t at the top of the daily headlines. A good parallel example is perhaps our desire to find technological solutions to warfighting — we like to find a silver bullet to solve a particular problem, but the reality is that while wars may be fought with weapons, they are won by soldiers and the underlying causes usually can’t be fixed with technology. RP: Of the projects you were involved with in Afghanistan, which one are you most proud of? GD: Overall, probably my work with Mine-Resistant, Ambush Protected vehicles. A lot of people contributed to refining interior designs, addressing rollover warning and ballistic protection, adding new sensors and capabilities, and developing the new MRAP Recovery Vehicle. 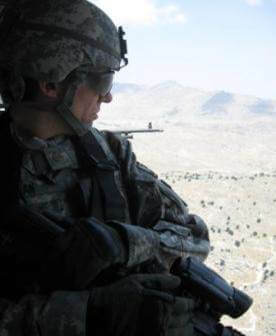 I was just a small part of a much larger team but I like to think I helped better protect our soldiers. RP: How optimistic or pessimistic are you for Afghanistan’s future? GD: Optimistic. The Afghan people I interacted with were tremendously innovative and resilient, and I think there is tremendous potential for them if they are given enough breathing space from violence to develop and strengthen their own institutions. I’ve been encouraged by what I read about successes by ISAF forces in partnering with their Afghan counterparts, but it will be up to the Afghans to sustain that effort as the level of international focus decreases. RP: You’ve written three books. Will you be writing more, and if so, what will they be about? GD: Well, perhaps it’s two books and an essay. Eventually, I’ll probably write more. I’ve been considering for some time writing a memoir of the time I spent working as the Small Arms Chief at Fort Benning. I was neck-deep in the effort to replace the M16 and M4 rifles with the XM8, among a number of other weapon projects, and think that a lot of people might find a “behind the scenes” look at that period interesting. Then there’s an outline for a novel about Afghanistan that I’ve been playing with, but I’m not convinced that fiction is really my thing. 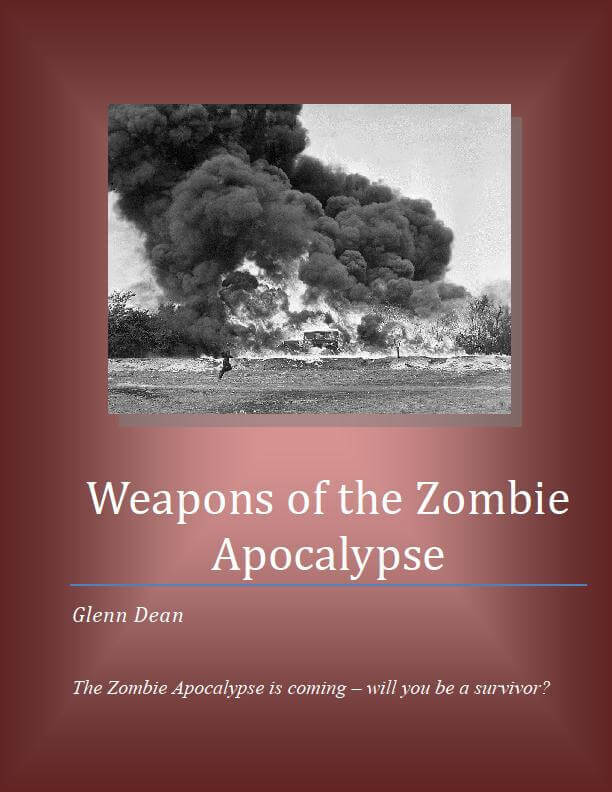 Weapons of the Zombie Apocalypse is kind of strange since it’s fiction written in a non-fiction style, but it isn’t a plot-and-character narrative. RP: Thanks for your time, Glenn. You’ve given some interesting answers. GD: It’s been my pleasure. Thank you for the opportunity, and thanks for reading the book!